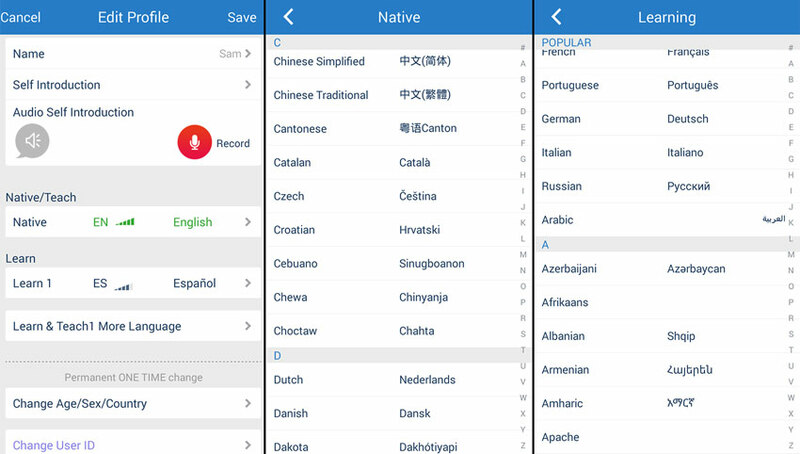 HelloTalk is a free language learning/exchange app for iOS and Android that lets you find native language speakers with which to practice. With over 2 million registered users from all four corners of the world and representing well over 100 languages, your chances of finding a friendly and helpful language exchange partner are as high as they can get. Unless you’re learning some obscure language spoken only in the remote jungles of Papua New Guinea, you have good chances of finding just what you’re looking for! I’ve been using the HelloTalk app for the past few months and I must say I’ve been pleasantly surprised by the very comprehensive nature of the app — from correcting other people’s sentences or formally requesting a language exchange session to translating sentences and talking over the phone, HelloTalk really has a lot to offer. Below, I first outline how the app works and how you can make the best use of it, and then I proceed with a quick analysis of the app’s good and bad sides. HOW DO I SIGN UP AND FIND NATIVE SPEAKERS? After downloading the app from the app store (iOS) or Google Play (Android), simply click on the app’s icon and you will be walked through a simple, step-by-step guide that explains a few key concepts (see picture below). Once your profile is all set up, it’s time to start looking for native speakers with whom to practice. 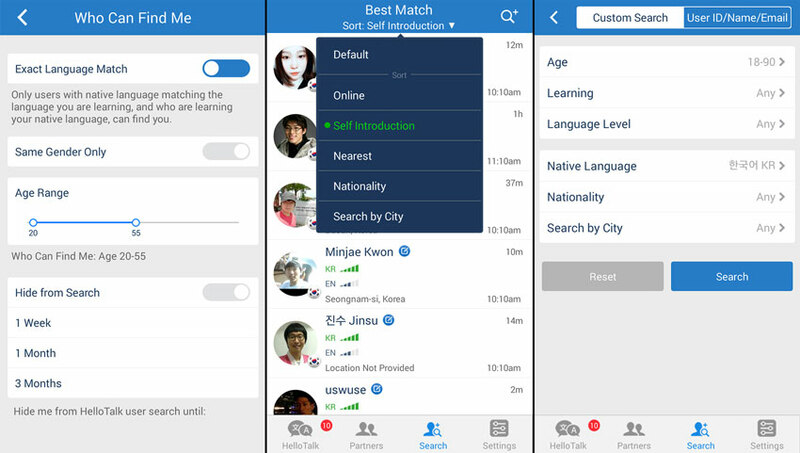 One thing that’s great about HelloTalk is that you can look for native speakers through a host of searching criteria, including age range, gender, language currently being learned, language level, native language, nationality, city, and more. While you’re not in any way obliged to make use of these search criteria, they can come in handy if you’d like to narrow your search and increase your odds of finding the right language exchange partner. The picture below shows some of the settings and criteria that can be used for narrowing down your search results. The same applies for when deciding who can find you. Searching for native speakers by city is a great tool. If you live in a medium to large-sized city, there are very good chances you will be able to find native speakers living nearby. This means that if there’s someone with whom you enjoy practicing your language and the two of you develop a productive and friendly relationship, there’s no stopping you from suggesting to meet in a café to practice your languages in person. Otherwise, it can be nice at times to have someone living in the same city or country as you, since you have more in common and it can be easier to make conversation, among others. OK, so now you’ve found the right person(s), and you’re ready to start talking and actually practicing your language skills. 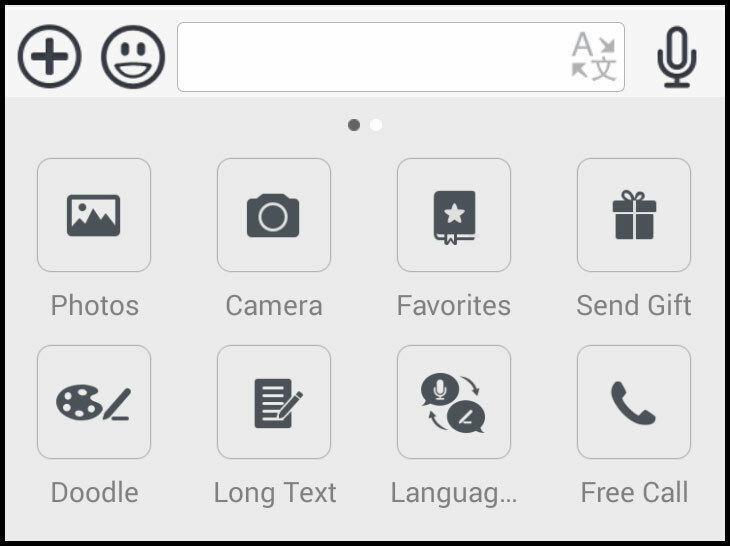 So what kinds of functions are available through the HelloTalk app, and how can you make best use of them? 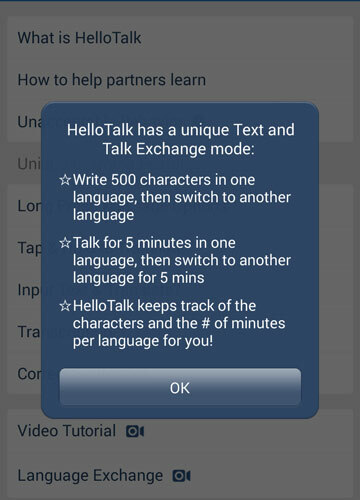 HelloTalk isn’t only about texting with native speakers, although it’s certainly one of the app’s main functions. Besides writing to your language exchange partners, for example, you can record short voice messages, use the “free call” function to talk over the phone, send photos, write long pieces of text, or even draw doodles! You can also formally invite someone to begin a “language exchange” session. That’s a useful feature because when doing language exchanges, there is often a tendency for one person to do most of the talking in the language they are learning. Using the language exchange feature formalizes the language exchange process and lets you chat for a certain period of time (or number of characters) in a certain language before you are prompted to switch to the other. One of the other features I found the most helpful is the “correct sentences” function (see picture below). This essentially lets you correct your language exchange partner so that s/he can clearly see where a mistake was made. Once a sentence is corrected, you will see one sentence with the mistake striked through in red, with the correct version below next to a green checkmark. While you shouldn’t correct every single sentence your friend is making (they’ll end up discouraged and frustrated! ), it’s a neat way of showing your language exchange partner a mistake s/he may be making repeatedly, for example. HelloTalk has so many features that, frankly, it would take me the entire day to write about all of them. But let me highlight, before we turn to the concluding section of this article, that the app also features tools for translation, transliteration and pronunciation. When chatting with someone and there’s something you don’t understand, simply long press a sentence and you’ll be prompted to choose from an array of options (see picture above), one of which includes translation or transliteration (if you’re dealing with a language such as Chinese, which uses characters rather than an alphabet, this can come in very handy). So even if you’ve only learned how to read pinyin and you can’t read Chinese characters yet, the transliteration function will make it easy for you to understand what’s being said to you. 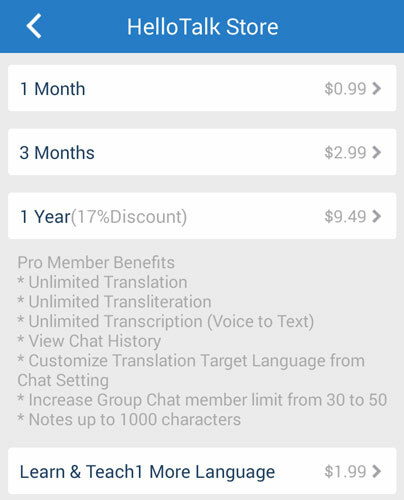 Another option available is an actual translation tool, separate from the chat window, where you can enter any word or sentence to translate into your native language. This can be useful when you want to communicate something to your language exchange partner but don’t know how yet. The app is user friendly (and unless you sign up for the premium version, it’s FREE! ), and right from the moment you sign up for a new account, you’ll have enthusiastic language learners getting in touch with you. The search criteria are really helpful and allow you to narrow down your search results. Searching for language exchange partners by city or country is very useful and can even be a great way to find new friends living nearby. 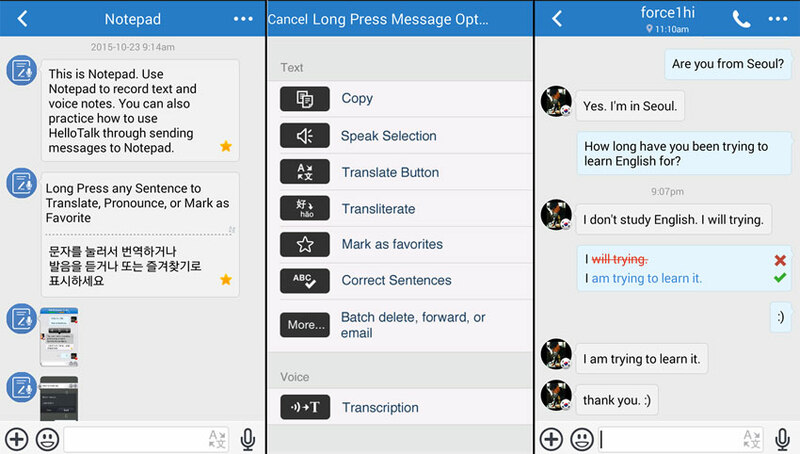 The chat functions, including “correcting sentences”, translation/transliteration, and “free call”, are extremely useful in the context of language learning. User profiles give you just enough information to help you decide whether the person seems like an interesting match to begin a conversation with. I’ve been sitting here for 10 minutes trying to think about bad sides to this app. Frankly, I cannot think of any, except maybe for the fact that the free version of the app does have some limited features. But there’s evidently been an enormous amount of work and resources poured into the making of this app, so it’s only logical that there is a price to pay for its unlimited use. 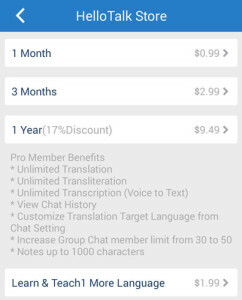 In any case, a “premium” membership, which costs $0.99/month (or $9.49/year) will get you unlimited translation/transliteration, as well as a bunch of other features (see picture below), a surprisingly reasonable price to pay for accessing all of what HelloTalk has to offer. So, have you tried using HelloTalk yet? Share with the rest of us your experience using the app in the comments section below!